Projects Abroad conservation volunteers and staff have been instrumental in the discovery of a new species of bird in the Taricaya Ecological Reserve, in Peru. The landmark discovery was confirmed by ornithology experts at the end of May. 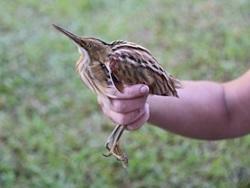 The new species of bird is the stripe-backed bittern (Ixobrychus involucris). The stripe-backed bittern is a wading bird that has only ever been recorded as a ‘hypothetical’ bird species in Peru, after a suspected sighting nearly 50 years ago. Although found in other South American countries, the presence of the bird in Peru has never been confirmed until now. The stipe-backed bittern will now be added to the official list of birds of Peru. Taricaya is also one of the first official bird banding stations in Peru and Projects Abroad staff and volunteers have been successful in ringing over 2,000 birds so far. Bird banding is a method used for studying the movement and behavior of birds; the process enables further study of local and seasonal migrations, reproductive cycles and life spans. Our Peru team has also been responsible for the recapture of small, understorey species of manakins and antbirds, ten years after their initial recording. The discovery of the stripe-backed bittern in Peru is the pinnacle of 14 years of research by Projects Abroad Peru conservation staff and volunteers, and is a welcome addition to the hugely diverse ecosystem present in Taricaya. The Taricaya Ecological Reserve hosts a staggering 467 bird species in 476 hectares; these remarkable figures are close to a world record and pinpoint the reserve as a hotspot for wildlife. In comparison, the Tambopata-Candamo National Reserve, adjacent to Taricaya, is home to over 650 bird species in an area of over 270,000 hectares. Projects Abroad is thrilled that our volunteers and staff in Peru are at the forefront of this scientific breakthrough and we are proud to have made such a positive contribution to Peruvian conservation and biodiversity research. We congratulate our Projects Abroad Peru team on their efforts and look forward to more exciting news from Taricaya.